Have you attended a college fair recently? These events are more valuable than the endless pens that are available for the taking. You can make the most of your college fair experience by doing a few simple things. Check out this guide to college fairs to get started. If you are going to be attending a NACAC fair, it is important for you to register in advance. Registration affords you the opportunity to receive a bar code that allows you to effortlessly transmit your personal information to colleges, saving you untold hours of painstakingly filling out interest cards by hand. Once you register, do some research. See which colleges will be in attendance at the fair, and plan to visit with those schools that you are most interested in. Not sure of which schools you favor? Do yourself a favor and research a list of schools that offer programs that you might be interested in. With over 200 colleges present at some fairs, knowing which schools offer your program could save you a lot of time. 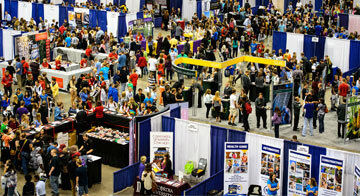 Have you attended any college fairs? We would love to hear about your experiences below.